Steph’s Last Tanzanian Post – Bday Dream Comes True! …one (dream) was to go to the office of Radio Tanzania, the national radio station, which has a large collection (157) of field recordings of tribal music, which they sell on dubbed cassettes (poor quality, sadly) for $1.00 each. I got 12. Thanks to Keith, several months before I came to Tanzania I had the opportunity to hear a CD of some traditional music from the Gogo tribe. The people are called Wagogo. That music instantly captivated me and I couldn’t believe my ears. I loved it! 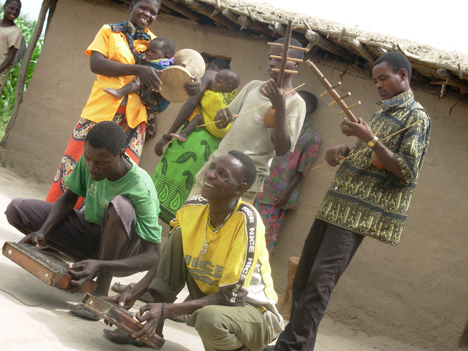 The Wagogo are the ones who play zeze.From the liner notes I saw that their land is in the area around Dodoma. 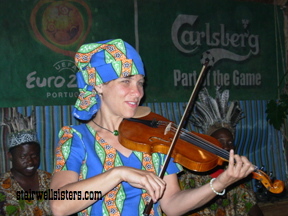 I decided then that I was going to find the Wagogo people and play music with them! Call it a pipe dream, but guess how I spent the day before and the day of my birthday??? In a remote hamlet, not even a village, out in the Wagogo countryside, surrounded by an entire village, eager to perform their music and dance for me! They hoped, of course, that I could help them get a recording and more support, I told them I couldn’t and that I was there as a fellow musician interested to share music with them, although I did contribute money and beer to the various choir leaders. I also wanted to give them Sisters’ CDS, but they didn’t know what CDs were. My driver said he would copy the CDs onto tapes and give them to the musicians. And if anyone has any ideas about helping Zeze orchestras, talk to me! Benefit For Our Dear Uncle Bruce! Thats right, we’re leaving the Marshall stacks at home this time to play a couple of unplugged, upclose & personal sets to raise a little money for a friend in need. Our dear Uncle Bruce got hurt at work last week, and a bunch of his pals are doing what they can to help out while he’s on the mend. Bruce has been one of our most loyal fans & biggest supporters over the years (you may have seen him dancing in the back row of our concerts, wearing his Stairwell Sisters T-shirt! ), so we’re happy to return the favor! About Philz Coffee: Philz Coffee is a great little place that is quickly becoming a neighborhood institution. Delicious “handmade” coffee, a comfortable casual space, and a sweet staff. This mission district appearance is one of our only shows in SF for a long time, so city dwellers, come on out & shake your funky stuff. Steph (Mama Afrika) finally pulls out her fiddle – and tries on a new one (a zeze). Fiddle face isn’t exclusive to appalachian fiddling, apparently. Besides playing fiddle and singing with my Sisters, I am committed to protecting and preserving health and environment. After two and a half years of unemployment/underemployment and some soul-searching, I decided to look forward to traveling to a foreign (poor) country and contributing what I can towards health and environment, rather than to dread another bout of job-hunting after my bio-tech position ends in November, 2005. I found an opportunity to go to a small village near Arusha, Tanzania for three months with the non-profit volunteer organization Cross Cultural Solutions. I’ll go in January, and return (via Zanzibar) in April. Arusha is home of the Rwanada Genocide Tribunal and the base of many safari companies, so there should be some quite interesting foreigners around. Still, it’s appreciating the local people and the native culture that really excites me. I’m studying Swahili. And, I’ll bring my fiddle, so I can communicate with people independent of spoken language. I bet I will get into some pretty amazing music sessions. Maybe I will find my Tanzanian Sisters and Misters! I’m reading about all the public health, environmental protection, and community empowerment projects in Tanzania I can find. I don’t know exactly what I will be doing once I’m there, and even if I thought I did, I know it will be something quite different once I get there anyway. I’m going with a flexible attitude and a commitment to contribution. I’ll miss you all and look forward to sharing my adventures with you once I’m back. Meanwhile, big thanks to my Sisters, friends, fans, and especially fiddle angel Elise Engelberg for carrying on while I’m gone.